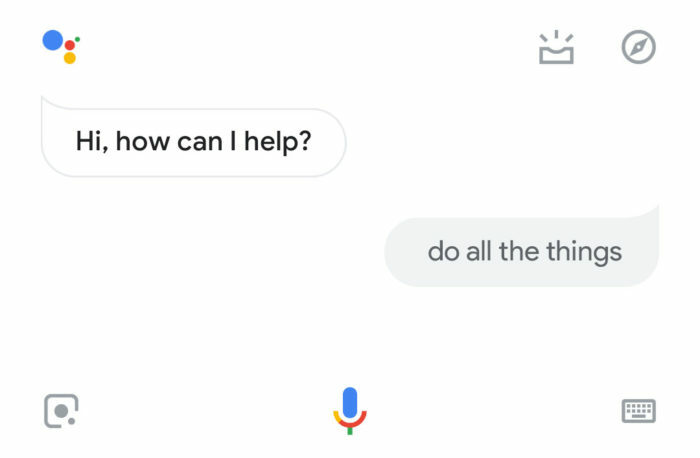 User: OK Google, add apples to my shopping list. Assistant: That’s already on your shopping list, dummy. User: Hey Google, send a message to Gary. Assistant: Shut up, Gary is sleeping right now. User: Okay Google, clear my schedule. Assistant: You have nothing on your agenda for today. User: Just make me look important. Assistant: Got it, cancelling “Lunch with the President” at 12pm. User: Hey Google, make a JIF. Assistant: It’s pronounced GIF, Einstein. User: Okay Google, what will the weather be like at 5pm? Assistant: Cold and rainy and yucky. User: Hey Google, make a sarcastic comment. Assistant: Sure, because that’s a great use of my time. User: Okay Google, play the next episode. Assistant: Perhaps it’s time to go outside? User: Hey Google, turn off the lights at 10pm. No problem, setting a reminder for you to GO AND DO IT YOURSELF! User: OK Google, play Christmas music. Assistant: Dude, it’s not Christmas yet!